I have learned not to use the phrase “things happen for a reason”. It can be a truly offensive statement to those who are struggling to find that reason for their situation, especially in cases of terminal illness. 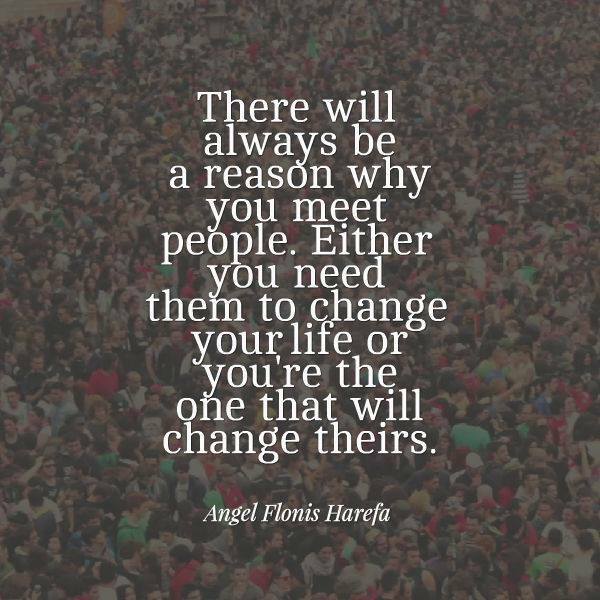 However, I am a firm believer that people are brought into your life for a reason. I have blogged before about my marriage and subsequent divorce and how much I learned about myself and my strength throughout that process. Had my ex-husband not come into my life and had I not said yes to the proposal, my life would be very different today. I would still be clinging to the notion that it was my purpose in life to “fix” people who I knew were broken. My courage to walk away from that marriage was the beginning of my evolution. Perhaps my believing in reincarnation allows me to be so sure that souls connect and somehow find each other in each lifetime. I have argued this point before when trying to explain the feeling of Deja Vu when you meet a stranger. It is certainly not a scientifically proven fact but it warms my heart to think that people gravitate towards the souls with whom they are meant to be connected. I have very strong bonds with certain people in my life. I know they have changed my life just by their very presence and, in some ways, I know I have changed their lives with my presence. That connection draws us and keeps us together. And it is that connection that makes me confident that we were meant to find each other again and prove that change is not always a frightening thing. Reincarnation, interesting theory. I don’t subscribe to it myself but there is an element of attractiveness to it. I love your train of thought on this! I do still say everything happens for a reason, but you’re right, it can be a tough pill to swallow when the things happening are so negative particularly the loss of a loved one in some fashion (i.e. – illness, car accident, homicide, etc.). I try and be careful of when I say that but I also love your approach because I so believe this to be true about a friend of mine, whom I lost a year and a half ago to cancer. I met her late in her life but it came at a time when we both needed friends and eventually her dog would need a new owner (that’s me now lol) and it’s all worked out. She was a positive influence for me and I’m so grateful to have had her in my world even if it was for a short time. 🙂 Lovely post! Connections sustain us, don’t they?